In the 19th and early 20th centuries, coal from South Wales went all around the trade routes of the world with hundreds of coal supply depots set up in the remotest corners of the globe. But nowhere was the re-supply of these depots and ports more risky to ships and their crews than the treacherous waters around Cape Horn. The story of those other great coal-carrying ships the Cutty Sark and the ss Great Britain is told elsewhere but here are the stories of four ships that constantly fought their way around the Horn heading for the west coast of the Americas before the Panama Canal was opened in 1914. 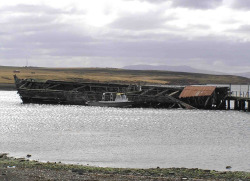 The remains of the Vicar of Bray still lie at the settlement of Goose Green in the Falkland Islands. She was a barque built at Whitehaven in 1841 and eight years later, at the time of the California Gold Rush, she was part of a vast fleet of ships that rounded Cape Horn bound for San Francisco. Carrying a cargo of mercury, she arrived there in November 1849, but within three days her entire crew had deserted for the gold fields. Captain Charles Duggan stayed with his ship and paid exorbitant wages to eventually raise a crew for the return journey. Twenty years later, in 1870, 133 days out of Swansea, carrying a cargo of coal bound for Valparaiso on the west coast of Chile, she was damaged in a storm and forced into Port Stanley for repairs. Eventually, she was bought by the Falkland Islands Company and refitted for trading between London and the Falklands. Her career ended in 1880, when she became a storage hulk at Stanley and then later moved to Goose Green. For many years her hull was used as a jetty and although it still does today, it is now partly submerged and in extremely poor condition. The last twenty years have seen much deterioration and she is now almost completely unrecognizable as the fine ship she once was. On this voyage she seemed to be alive… tearing through the mountainous greybeards of the southern ocean at 15 or even 16 knots, the irresistible force driving her cutter through the boiling seas, the wake of white form, the board-like stiffness of her sails, the roaring hissing rollers, lifting the stern, passing the ship, and surging ahead with sea and air filled with ozone laden flying spume, every sail, spar and rope humming, roaring or whistling the song of the gale. If there are any remains of the Patmos, they lie deep on the sea bed of Drake's Passage between South America and Antarctica. For hers is a poignant yet all to familiar story of her time. In 1876 Charles Nichols took his first command, the American wooden barque Patmos, for a honeymoon voyage with his new wife Millicent, across the Atlantic carrying export goods. At Cardiff they loaded best Welsh coal bound for Valparaiso in Chile on the west coast of South America. Eight weeks out, the Patmos was approaching Cape Horn, standing south west of the Falkland Islands. She passed Cape St John and was making good westing when the wind suddenly headed the barque and Captain Nichols was forced to the southward fighting a full gale. The weather quickly grew very cold. Soon smoke was found in the fo'c'sle; spontaneous combustion had broken out in the hold and a ball of glowing carbon under the coal was spreading rapidly and water only encouraged it. They battened down tight and tacked to the north. The cargo was on fire and a heavy westerly wind with ice bearing down on them! The decks were wet with the seas; but soon the heat began to melt the pitch having burnt out the oakum underneath. The deck began to leak and the cabins became untenable; the crew knew they had a fight on their hands and nothing was overlooked. But the 'tween decks was aflame; the wooden hatch covers were charred and collapsed under the pound of Cape Horn water. In the galley, filled with smoke, they kept the copper boilers going though at any moment the deck, the galley, and all might drop into the fire. Sea water began rising in the well. Nichols hove-to on the port tack, surging in towards Cape Horn. Fire burst though aft, driving the crew from the quarterdeck; nothing more could be done. The men roused the long boat over the forecastle rail, lashed it and stowed some beef and hardtack. Captain Nicholls carried his wife wrapped in oilskins, over the submerged waist of the ship, all hands were now on the forecastle. The scene, as night came on with the wind roaring above the furnace, was terrible in the extreme. Never had such a more distressed ship struggled against the elements. Flashes of fire streamed to leeward in showers of sparks; spars cracked; the stay sails were afire. Only the long white slits of the lower topsails showed above the hell below. How long would it be before the masts burnt through? The ship began to settle, they would launch the boat at daylight. The ship was all but awash when the men and the skipper's wife got aboard the long boat in an orderly way. The skipper was the last to leave and they rowed out clear, watching the seas. The Patmos was settling by the stern. Enormous clouds of black, yellowing smoke belched above the main hatch. The sea was drowning out the flames. Might she yet remain float? They held off; the skipper at the steering oar kept the boat's head to the seas. But no, she was settling further. The wind was whipping the boat away, tearing off the crests of combers, drenching them with spray; the men pulled no matter. The barque was tottering, she was quenched; sinking below the sea. All that day they watched the oncoming rollers. The blackened crew were worn out as they bailed the icy water. The next night, the most terrible of all, fought them minute by minute. Bailing, rigging washboards, in spells at the oars, the men struggled through to dawn. Daylight! As they lifted to the top of the seas, they saw a jagged outline of the lower Cordilleras; they were closing the coast of Tierra Del Fuego. “Sail; sail Ho!” On a high lift they saw the canvas of a ship close-hauled, clawing off-shore under goose-winged lower topsails. The skipper worked to meet her as she surged to leeward. For hours they struggled as men do when they are bursting their hearts for survival. The vessel saw them and she fired a gun. Men lined the rail of the low, rusty sided iron British vessel. As they approached seamen threw over lines. Mrs Nichols was whipped on board and the men clambered on her chains as the ship, the Pretricia, heeled far over to the blasts. Last came Captain Nichols, carrying his ship's papers; he swung up and the half-swamped long boat blew away, met a sea and capsized. But if the crew of the Patmos thought they were safe they were mistaken for the Pretricia herself was in dire trouble. The growl of close surf came back with the gale- squalls struck the ship and she bent over to her scuppers, dragging to leeward and closer to the beckoning rocks, west of Cape Horn. The ship had been losing ground for hours, and was waiting for the strike. Her crew were exhausted from the struggle of trying to escape. Yet now, with twice the crew, new orders seem to electrify the stricken ship. She had steel standing rigging, metal turnbuckles and stout iron masts. They piled on all the heavy canvas, pinching her to the wind, with four hands at the wheel. As the helm eased she was bourn over 'til her mast coats washed in the white froth, the lee rail under water. The strong iron hull began to complain; her weather bilge resounded with the pound of the seas, but she was moving- ahead! As fast as staysails were blown away, spares were bent on. The mizzen tops'l split and shot to leeward, soundless in the howling gale, she trembled with every sea. But the Pretricia responded; she met and bested the sea. As night fell the strong Clyde built iron ship ratched clear, with sea room and water under her keel. That night they drove her unmercifully. All hands were on deck; with the coming of the day, a shift of wind into the south gave them a fair slant and they were round. 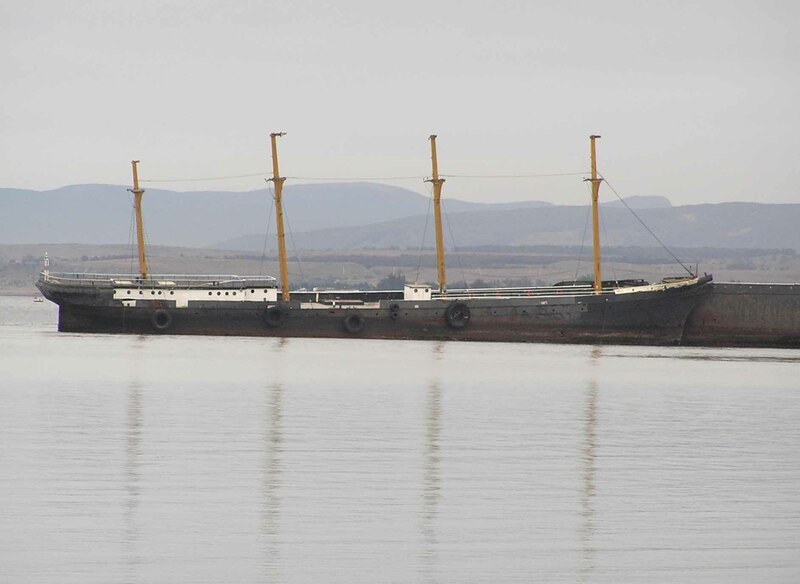 The Pretricia, also laden with Welsh coal bound for Valparaiso, made her port on the coast of Chile with all safe. Captain Nichols went on to spend a lifetime at sea in charge of some great sailing ships and rounded the Horn on many occasions, some in fearsome storms. But never did he have such a close call as the night the Patmos went afire and sank from under him. It is a story, not only of ships carrying Welsh coal but ships of all nations and of captains and crews wearily nursing battered vessels around the most fearsome trade route in the world. On the 20th January 1913, the steamship Brodland left Port Talbot Docks bound for Punta Arenas in Chile with 2,500 tons of Welsh coal. She was being assisted and under tow by the tug Emily Charlotte due to heavy seas and a gale force wind. In a sudden squall, the tow-line parted and the Brodland was driven ashore on the sandy beach close to Aberavon’s North Pier. All forty-two members of the crew were brought safely ashore by the local Life Saving Apparatus Team led by Captain Humphrey Jones and helped by the many workmen who had rushed to the beach to give assistance. Amongst the crew was a local man, F.L. James, the ship’s carpenter and last ashore was the master Captain Vernon A. Scott. The literal translation of her destination port, Punta Arenas, is Sandy Beach but Aberavon was not the one her owners had in mind. 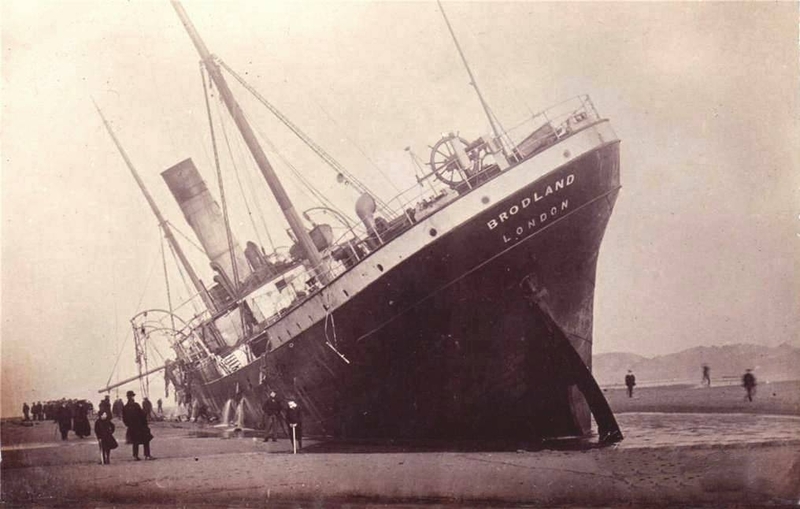 The Brodland was built in 1891 by Craig, Taylor & Co. at Stockton on Tees. She was launched as the Highland Mary but was re-named when she was purchased by the Brodland Steamship Company in 1912. After the grounding she became a total wreck and was later broken up for scrap. Her anchor is still on display outside the Aberavon Lifeboat Station. Cardiff seamen were able to visit Cape Horn without too much difficulty, it was a pub of the same name, in Bute Street. Although like it's namesake, sailors often had trouble getting passed it and were sometimes lucky to escape it's clutches! For Swansea men too, the pub the Cape Horner stood, and still stands, just outside the dock gates. Perhaps in a small way, this might serve as a memorial to all the men and ships lost in the treacherous waters around Cape Horn.